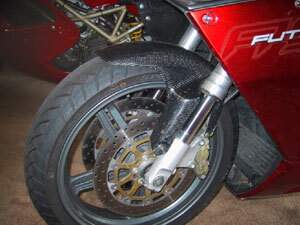 The front mudguard (or fender if you’re from the US) on the Aprilia RST1000 Futura is unique to the bike, but others will fit for a sportier look. Wolfie’s Futura, pictured, looks particularly handsome with a carbon fibre RSV front mudguard. That’s the models fitted with Showa forks. It’s not clear whether up to 03 RSVR Ohlins equipped mudguards will fit, and those from later, radial calipered bikes most likely won’t. The Futura’s mudguard is a specific shape to aid the bike’s aerodynamic properties and it’s likely fitting a mudguard from another bike will alter those properties. So take it easy at first.